BACK ON STAGE IN APRIL! I'm going to be back on stage in Bonn, at the Euro Theater Central, April 13, 2019, 20:00 Uhr, doing WHITE RABBIT, RED RABBIT (in English) by Nassim Soleimanpour. No rehearsals. No director. No set. A different performer reads the script cold for the first time at each performance. As a unique theatre experience, WHITE RABBIT, RED RABBIT by Iranian writer Nassim Soleimanpour has been played worldwide, translated in 25 languages and creates a fascinating evening about freedom, manipulation and conformity. This is not only going to be a unique experience for me but for the audience as well. I'm really looking forward to it! I want to thank everyone who has supported me and my show for the past 6 years. The show is available for events and other special occasions. A modular, shorter version of the show can be booked. Please click on the CONTACT ME button below. I'm looking forward to hearing from you! Once upon a time there was a little girl from a very big, very strange country. This is the unbelievable story of Kathleen Renish who left her whacky, orthodox Catholic family in Pennsylvania, only to crash land with a musical company in Germany right when the Berlin Wall came down! Get the story why Kathleen decided never to leave Germany again - despite her own culture shocks like the German T.V. police, housecleaning craze and third world washing machines. That is: learn everything and anything about the power of love - and how the Gemericans put it. and after all, with the wonderful singing Ms. Renish. "Warum sie trotz mangelnder öffentlicher Toiletten und Kaninchenstall-Wohnungen mit teuren Küchen und vorsintflutlichen Waschmaschinen in Deutschland hängen blieb. Klar: Es war die Liebe...."
"...Besides "high German", she also speaks the Cologne dialect, Koelsch. Stiff British English is not her thing but instead the solid, hearty U.S. east coast English. ​With non-existent public toilets, and rabbit cage sized apartments with expensive kitchens and antediluvian washing machines, she is still "stuck" in Germany. Naturally: It's because of love..."
"...Thank you so much for this amazing and heart-warming show! We had so much fun and you both were great!..." 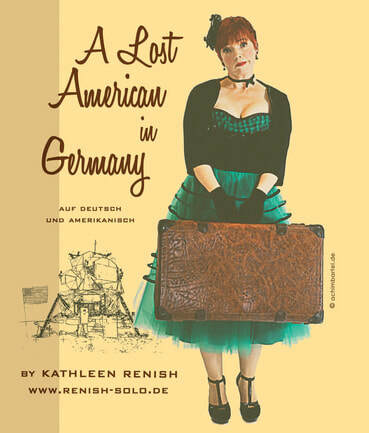 "...A Lost American In Germany last night at Euro Theater Central in Bonn with and by Kathleen Renish. What a fantastic performer and what a great story, what a life!..." "...Thanks for an amazing show! It was entertaining, funny, touching- I love you singing and Georg at the guitar..."
"...It was great! Thank you!..." The final performance was on Saturday, October 29, 2016 at the ﻿Euro Theater Central Bonn﻿.